44% of you feel that if a slightly different set of criteria were applied, men have just as much pressure to “look good” as women do. 38% of you call malarkey on that. 14% of you found yourselves looking at the men around you and not being impressed in the least. I’m torn on this one. I think they do have some pressure, not as much as women, but I think they can get away with more. 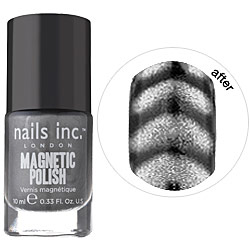 Today I want to know what you think about magnetic nail polish. This entry was posted on Monday, October 24th, 2011 at 1:33 am by Glinda and is filed under Hot Right Now, Nail Color, Nails. You can follow any responses to this entry through the RSS 2.0 feed. Both comments and pings are currently closed. There’s no “WTF? !” selection on the poll, so I’m out. Sixteen bucks a bottle.